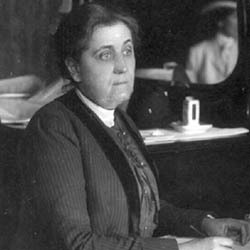 Miss Jane Addams, of Hull House, Chicago does not think that the whole duty of a husband is to support his family, nor that he entirely deserves all the obliquy [heaped] upon him when he does not do it. Miss Addams can even view without hysterics the spectacle of the wife and mother in the role of breadwinner. 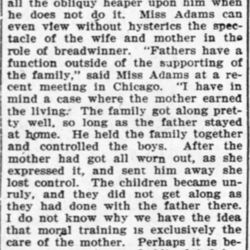 "Fathers have afunction outside of the supporting of the family" said Miss Addams at a recent meeting in Chicago. "I have in mind a case where the mother earned the living. The family got along pretty well, so long as the father stayed at home. He held the family together and controlled the boys. After the mother had got all worn out, as she expressed it, and sent him away she lost control. The children became unruly, and they did not get along as they had done with the father there. I do not know why he have the idea that moral training is exclusively the care of the mother. Perhaps it is because we are in the habit of judging the father only on his capacity for earning and the mother on her capacity for holding the family together. It is a mistake. We should not lose sight of the fact that it is a partnership relation. It take both to hold the family together." The Whole Duty of Man, Wilmington Messenger, June 3, 1906, p. 10. The article was also published in the Wilmington Semi-Weekly Messenger on June 8, 1906. 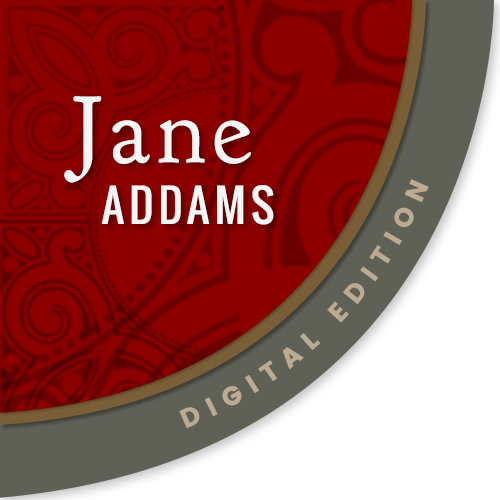 Addams, Jane , “The Whole Duty of Man, June 3, 1906,” Jane Addams Digital Edition, accessed April 22, 2019, https://digital.janeaddams.ramapo.edu/items/show/8800.